Just a note to say thanks again. It was a bit rough this year, but as usual you came through. We arrived on Friday, a very warm Friday and after drinking a couple of gallons of water, the tent was up, the stuff moved in and we were ready to go. After a visit with our friend and reenactor coordinator Jim Barnes, we went in search of dinner at the “building with the cow on top”. I do love a general store that serves food, sells hardware, Borax and 9,000 other things that you really might need someday. Just as we arrived back at the site, all hell broke loose. Yep, it was the “storm”. Mother nature at her best or worst depending on how you look at things like that. 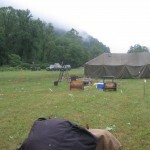 We held up the tent, got wet and marveled that anything was still standing. 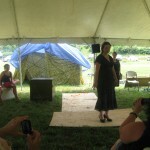 The show tent moved a bit, the GP medium went down. Jim and others went around to help and calm the “rookies”, experience in these matters is always welcome. 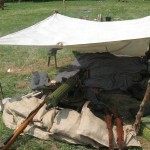 As the storm wound down, I took a look outside and knew that some of my fellow reenactors were in for a long night. 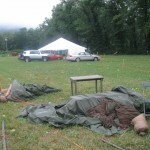 We tripled the stakes on the tent, offered a bit of dry shelter to a friend and got some sleep. 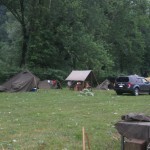 Saturday morning, the site did look a bit like a war zone, tents down, branches scattered about. We made some coffee and offered to share with the storm weary. We were complimented on the fact that our tent survived, but then we had seen this kind of thing before. Something like “this ain’t our first rodeo”. (Well, at least the “rookies” will have exciting stories to tell). The morning was work intensive as people cleaned up and dried out. We found out that the town had no electric power, and the band could not make the event due to the weather. The dance had to be cancelled sadly. 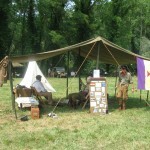 We did have visitors and enjoyed talking to them and other reenactors. Now here is the part where you Rowlesburg, really shine. 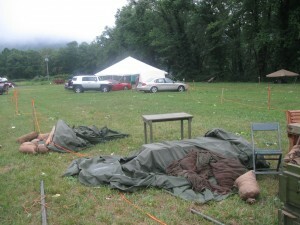 Although the dance was cancelled, the folks brought food and beer down to the site for the reenactors. In other places if you were lucky enough to actually get fed, it would probably not have happened. And on Sunday morning, despite the lack of power, the folks of the town still fed us breakfast at theVFW. I spoke to a lady that was serving juice and remarked on the fact that it was incredible that they were able to do so much even in the face of a big storm. She replied, “People in this town always find a way”. So, there it is. You did find a way and those of us lucky enough to enjoy your hospitality are forever grateful and will forever admire you tenacity in the face of large problems. 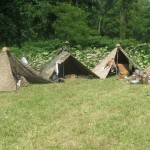 I will be back next year Rowlesburg and I will encourage my fellow reenactors to make the trip. We will find a way.